The Eurasian Black Vulture (Aegypius monachus) is also known as the Monk Vulture, the Cinereous Vulture, or just the Black Vulture. It is the only species in the genus Aegypius. It is a very large bird of prey in the family Accipitridae which also includes many other diurnal raptors such as kites, buzzards and harriers. This bird is an Old World vulture, and is not related to the New World vultures which are in a separate family Cathartidae. It is therefore also unrelated to the American Black Vulture despite the similar name and coloration. It breeds across southern Europe and Asia from Spain to Japan, but is endangered throughout its European range. It is resident except in those parts of its range where hard winters cause limited movement. This vulture is 110-115 cm long with a 250-285 cm wingspan. It breeds in high mountains and large forests, nesting in trees. It has all dark plumage, and even at a distance can be distinguished from Griffon Vulture by its evenly broad "barn door" wings. It has the typical vulture "bald" head, and dark markings around the eye give it a menacing skull like appearance. 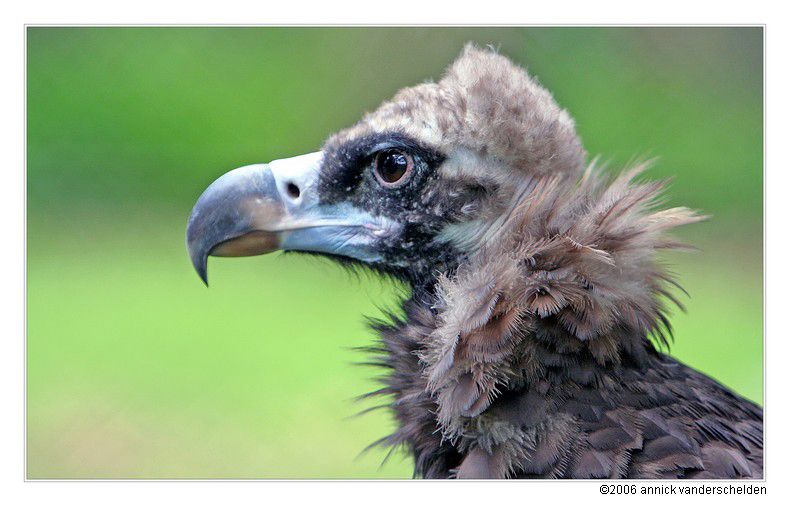 The Eurasian Black Vulture is usually larger than Griffon Vulture. Its more powerful bill is better suited to initially opening carcasses, and it takes priority over Griffons at corpses. Lovely shot of this untidy fella. Good clarity and sharpness. Nice colours. TFS. i like its hair style a lot. i should use it on my hair too :-) Great pose you captured with a lovely pose! perfect portrait of this bird, a common bird many years ago here in Romania, now just an accidental bird. bood sharpness, nice colour and the BG is perfect. Interesting vulture. I like this pose and the eye is very sharp. My compliments! What an ugly bird!! Excellent picture you took of it, but I did not make him a beauty! Voici un beau portrait de Vautour de profil. j'aime pas bien comme il nous regarde ce volatile ;-) Bonne nettet� et une PdC super qui a produit un agr�able fond doux. Spendid portrait of this impressive vulture! Excellent sharp details, great POV adn DOF, very fitting contrast between the colors of the subject and the BG, great light and framing. + composition, POV, sharpness, color, background, framing, lighting, notes. = DOF, focus (AV very tight). Good portrait of this increasingly thretened animal. A nice portrait, great detail and textures captured in the feathers, good focus on the eye and great light, nicely isolated against a distant background and good DOF to defocus it. I like the crop/composition too, it fits the image very well. Nice work. Oke Annick Ik kan me een beetje vinden in wat Ricardo zegt, maar daarintegen is het ook wel de moeite waard om wat meer te experimenteren. Een goede tip eerst is een monopod, leer deze te gebruiken, als U dit doet zult U hier later veel gemak van hebben. Probeer ook eena een paar foto's uit op 800 iso, oke dan krijg je meer ruis maar je F shot wordt wel hoger, wat beter is voor de scherpte diepte. Het is ook interesant om een flash te gebruiken. U hebt het hier niet zo op, maar ik kan U verzekeren, dat ook dit to betere resultaten zal leiden. Verder een goede compositie, waarvan ik zelf nog een stukje van liinks had gecropt, maar ook dit is persoonlijk, goed werk Annick. bien que l'oiseau ne soit pas un modele de beaut� vous avec reussi a nous faire un beau portrait net et color�. The details are nice, clear and sharp. superb colours, lighting and exposure. DOF is spot on and the POV is good. Thanks for posting, have a great week. Hi Annick, ugly birds but they make very interesting shots. This is a very good shot with excellent details and good control over the DOF. Very well done and TFS. Looks like he is thinking what to do. Great portrait shot. Good ditails, colours and POV. great shot, love the details and colors of this bird. POV, sharpness and background are great. Very nice retrat . magnifica definici�n. tr�s belle photo , cet oiseau quoi que l' on en dise est beau avec son petit ch�peau et son col .
And here we have a true "lord" among predatory birds! Great (as usual!) DOF and perfect POV. PS. very usuful picture data!